Turkish ice cream is more than a dessert among Turkish food. It's culture. My husband reading a label on an ice-cream in a country outside of Turkey, "This is not real ice cream, it doesn't have salep in it." Turks can not imagine an ice cream which doesn't have that one special ingredient - salep. Why does salep matter? Ice cream in Turkey boasts salep ingredient to give this dessert special flavor and texture. Salep is also a hot drink usually served in the cold months. You can find salep in Turkish sweets like kazandibi and even cakes. Salep used for any of the foods comes from the dried root of orchid, turned into dust. The purple orchid, salep is made from, grows in the Mediterranean region of Turkey with Marash as a major city in that region. Marash is the largest producer of salep which gives the ice cream a popular name - Marash Ice Cream or as a more recent name Kahramanmarash Ice Cream. Marash Ice Cream has a larger proportion of salep than other local ice creams. There is a type of ice cream called "kesme" which means "one that can be cut". It is served cut into rectangular pieces and doesn't easily melt unlike any other ice cream you are used to. The second magical ingredient of this frozen sweet is mastic. This plant substance is derived from a mastic tree mainly found on a Greek island in the Aegean Sea close to Turkey. Mastic gives the ice cream that chewiness and hard-to-melt quality. Turkish ice cream in general doesn't melt easily and has a great elasticity due to its ingredients. Street vendors wearing traditional clothes and clinging little bells on top of their stands attract customers to make ice cream purchase. Skillful sellers make a good use of the sticky qualities of this frozen delight and play a tricky game before the customer gets to the cone with ice cream. Be prepared to catch, reach, duck and look around before vendor lets you have your treat. Both kids and adults love the jokes the vendor makes. First time buyers get well taken aback and usually attract a large crowd of spectators. cranberry, black mulberry, coconut, dried apricot, dried figs, dried plums, mango, melon, pineapple, plum, with hazelnut milk (vegan friendly), raspberry, sour cherries, and of course the chocolate (bitter and milk). Now the practical part. Where can you find all these besides Turkey? Travel to Australia, Azerbaijan, Dubai, Bulgaria, Irak, North Cyprus, Qatar, Russia and Saudi Arabia. Turks are proud of their sweets. Ice cream in Turkish language is "dondurma" which literally means "one that is frozen". This word is used for any ice cream, not just the Turkish one. Many tourists fall in love with the unique taste of this sweet so much they bring it back to their home countries. How can you actually do this? 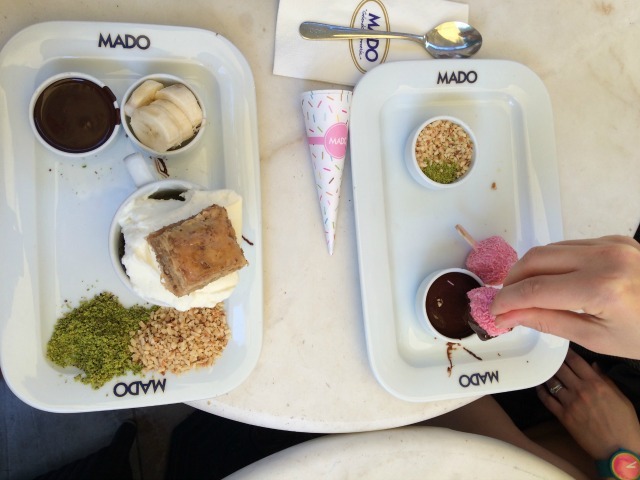 Ask your vendor (Mado is the top popular ice-cream seller in Turkey) to pack your piece in ice, good to go for a number of hours (up to 24!) you expect to travel before having access to a freezer.